Japan: Land of the rising scrum? Fervor for rugby in Japan at all levels is on the rise -- here a fan supports the "Cherry Blossoms" during a 2011 Rugby World Cup match in New Zealand. Japanese rugby was given a boost when the country was awarded the right to host the 15-a-side World Cup in 2019. It will be the first time Asia has staged the tournament. Japan has endured mixed results on the international stage but celebrated victory over Wales last year, the team's first victory in 80 years over a major rugby nation. 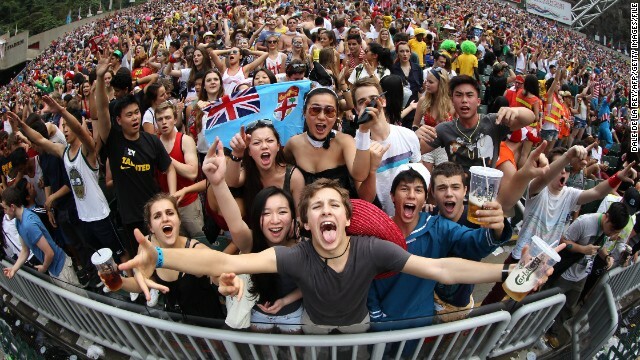 Backing for sevens is growing in Japan -- here female fans cheer on the national team at the 2013 Hong Kong Sevens. 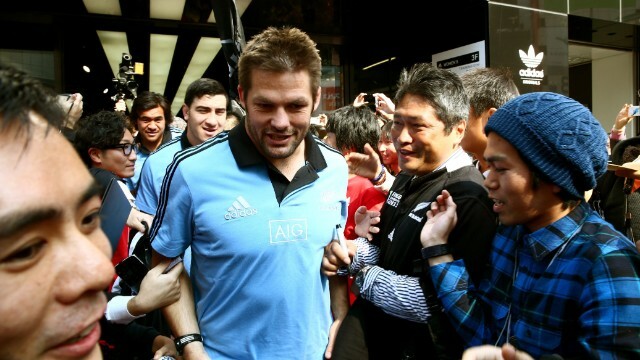 Also in 2013, the all-conquering All Blacks visited Japan for a full international, with New Zealand captain Richie McCaw being mobbed by fans. 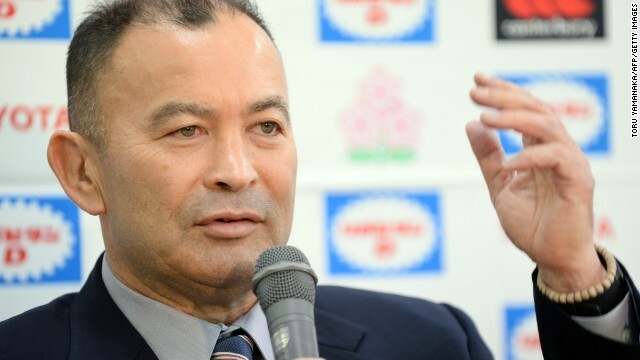 The national side is under the tutelage of Eddie Jones, the former Australia international coach who has a Japanese mother. 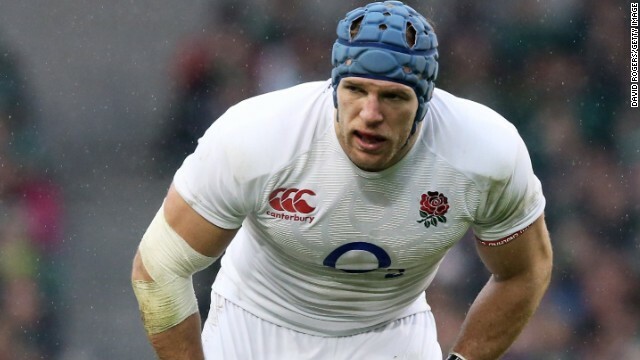 A host of international stars have played or play in Japan, including former England back-row forward James Haskell. (CNN) -- Nowhere else in world sport could a league title be decided in a match between a brewing and distilling group and an electronics behemoth -- but then again rugby in Japan is different. When last month Panasonic Wild Knights overhauled a deficit to beat Suntory Sungoliath 45-22, they were crowned champions of the domestic Top League. It may not be how things are done in powerhouse nations such as England and New Zealand but, in the land of the rising sun, rugby's popularity is on the increase. This weekend, the Tokyo Sevens will be hosted in the capital, while looming on the horizon is the larger prospect of the 2019 World Cup, making Japan the first Asian host of rugby's showpiece. 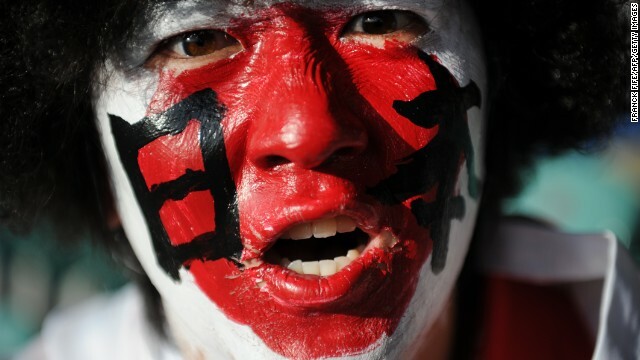 Rugby is already reasonably popular in Japan -- with 125,000 participants and 3,361 clubs, it boasts the sixth-largest playing population in the world -- but it is dwarfed by football and baseball, and coverage of the sport is by pay-per-view television only. Former England international James Haskell, who played for Tokyo's Ricoh Rams in 2011-12, believes those numbers are merely the tip of the iceberg. "Japan can be a proper rugby superpower, 100%," says Haskell, now back playing for English side Wasps. "You only have to look at the interest there and the number of people. There's been a change in attitude to coaching and the sport's growing massively. "There's often this perception that Japanese people are too small to be a proper rugby-playing nation. Some people suggested that I (at 6 foot 4 inches tall) would be a giant out here but there are plenty of people bigger. "But in terms of popularity and player numbers, the World Cup will take it to another level. The interest should spring further from there." Sevens is very new to Japan. As a result, playing numbers are still relatively low for this format of the game and this weekend's event in Tokyo will be the first appearance by a Japanese team in the 2013-14 HSBC Sevens World Series. But in 15-a-side, Japan has a surprisingly rich rugby history, although with the status of a minnow of the sport. The "Cherry Blossoms" have played in every World Cup since its inception in 1987, although the wins have been in short supply -- their sole victory coming against Zimbabwe in 1991. The first recorded game in the country took place in 1874 between British sailors in Yokohama but the sport was officially introduced by Professor Edward Bramwell Clarke and Ginnosuke Tanaka -- both graduates from Cambridge University in England -- at Tokyo's Keio University at the end of the 19th century. Clarke's goal was to alleviate boredom. He once stated that the students "seemed to have nothing to occupy them out of doors in the after-summer and after-winter days. Winter baseball had not yet come in and the young fellows loitered around wasting the hours and the lovely outdoor weather." With that, a university rugby scene was born and it remains the main feeding route for rugby players in Asia. Clarke argued that rugby played well to Japanese traditions, a view echoed today by ex-Prime Minister Yoshiro Mori, who led the Japan 2019 World Cup bid. "In rugby, one person doesn't become a star, one person plays for all, and all play for one," Mori stated. Japan is now the 13th ranked nation in global rugby terms but has ambitions to break into the top 10 by 2015 and the top eight in 2019 under former Australia coach Eddie Jones. The Tasmanian, whose mother is Japanese, coached Tokyo's Suntory Sungoliath from 2009-12 before taking over the national side. 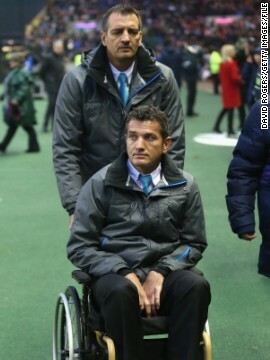 Joost van der Westhuizen is a legend of South African rugby who has been battling motor neurone disease since being diagnosed in 2011. He is now confined to a wheelchair but continues to travel the world promoting the J9 foundation, which raises money and awareness of his incurable disease. Van der Westhuizen in action at the famous Hong Kong rugby sevens event in 1993. The scrum-half made his debut for South Africa against Argentina in Buenos Aires in 1993, scoring a try in a 29-26 win for the Springboks. 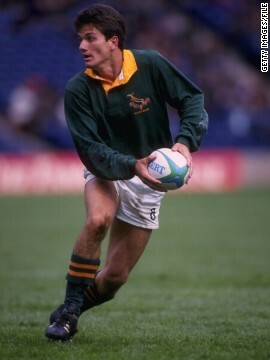 In 1995 Van der Westhuizen was part of the South Africa team which went down in sport history. The Springboks, led by captain Francois Pienaar, won the 1995 rugby World Cup final on home soil and were presented with the trophy by late president Nelson Mandela. It was a defining moment for the emerging, post-apartheid South Africa. The team's World Cup win was the inspiration for the movie "Invictus", starring Matt Damon as Pienaar and Morgan Freeman as Mandela. 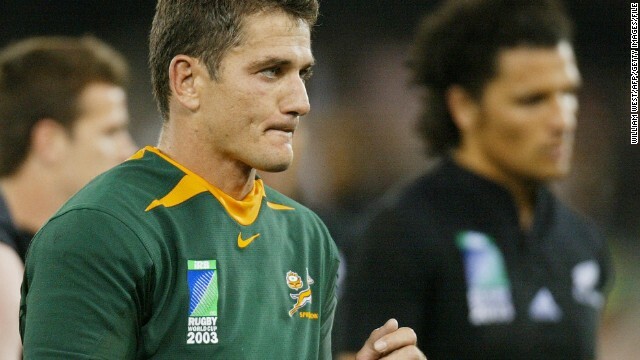 Van der Westhuizen played his final Test match for South Africa against New Zealand, in a quarterfinal defeat at the 2003 World Cup. At the time of his retirement, Van der Westhuizen was the most-capped player in Springboks history. 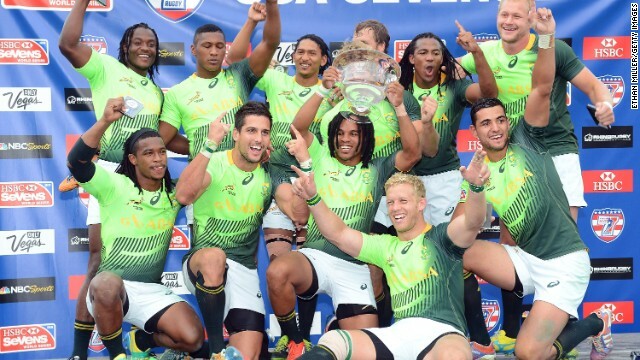 South Africa beat New Zealand 14-7 to win a second successive U.S. sevens title in Las Vegs. 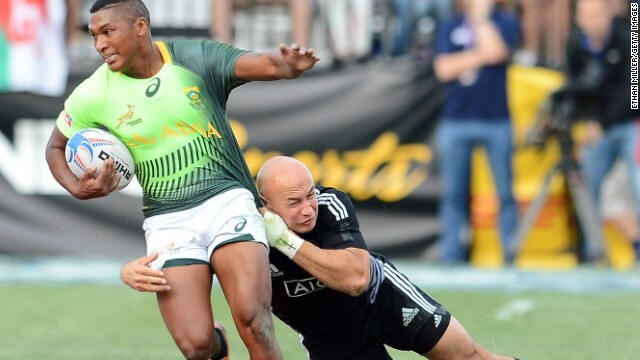 The victory took Neil Powell's team top of the Rugby Sevens World Series standings. The South Africans set a record with their U.S. success, conceding only 14 points in their six matches. 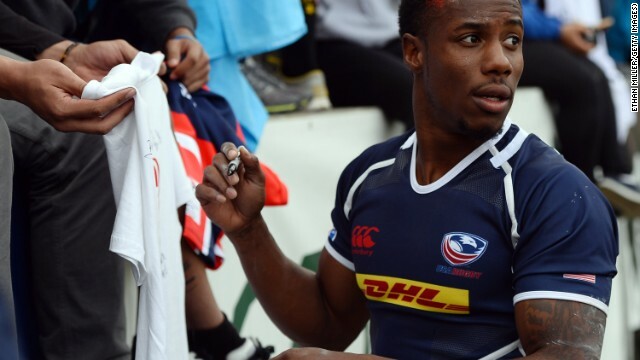 U.S. star Carlin Isles scored a superb try on Friday on the first day in Las Vegas, though the Americans lost 19-12 to Argentina before being beaten 14-12 by France. An American sporting event wouldn't be the same withouth cheerleading cheerleaders. 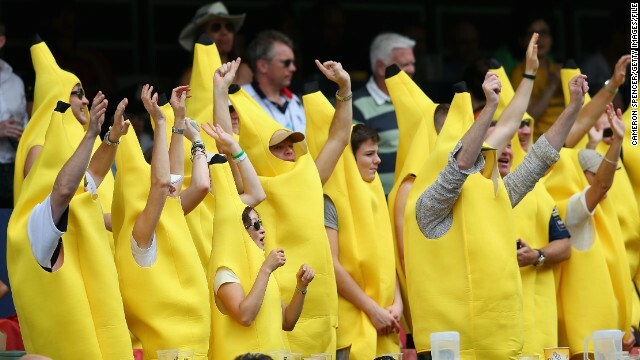 Rugby fans often favour fancy dress to show support for their team. 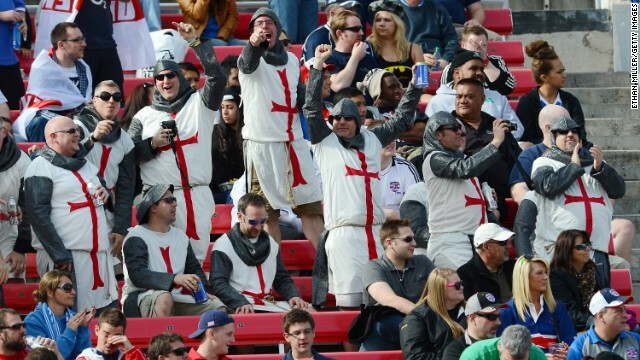 Here England fans sport a knightly look for their team in Las Vegas. "Japanese rugby culture is very different from any other rugby culture in the world so you've got to adjust to that and keep the good things of the culture and try to bring new things to the game here," the 54-year-old told CNN's Rugby Sevens Worldwide show. Jones is also pushing for a more Japanese flavor to the team rather than the heavy reliance on foreign players, who had qualified by residency, under previous coach John Kirwan -- himself a New Zealander -- at the 2011 World Cup. "Getting foreign players in and getting foreign coaches in here has helped Japan look outward," Jones says. 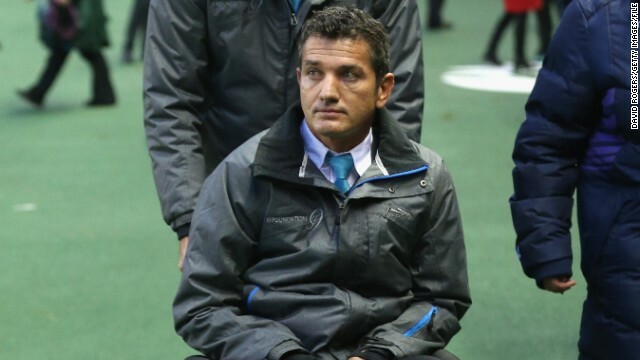 "With the World Cup in 2019 one of the most important things is to have a successful 15s side and a successful sevens side so that the momentum of rugby grows." Sevens, however, has a relatively small fan base in Japan, says Tomoshige Fujino, rugby correspondent of The Mainichi Newspapers group. "They are trying to strengthen the sport for Rio 2016 but are having a difficult time doing so at the moment," he says. Japan has one major disadvantage over most rugby-playing nations in that quest in that the majority of its players also have full-time jobs. Teams in the Top League, set up in 2003, are effectively big-name companies such as the aforementioned Panasonic and Suntory. "Everything has been geared towards domestic success, be it the university champion team or the company champion tournament team, and there's been no international outlook," Jones says. Usually just a small number of players are full-time rugby players and most of those are gaijan (foreigners) -- who have been coming to play in Japan since the 1970s. Prior to the game turning professional in 1996 there were accusations in Japan's direction of what was called "shamateurism" -- and these days players such as South African Jaque Fourie can boast salaries of around $850,000. About 7% of Top League players are from overseas, but only two foreigners can be on the pitch per side at any given time -- although the three-year residency rule slightly flouts that. "The Top League is a mixture of professional and amateur players," Fujino says. "Amateur players all belong and work for a corporation and these companies own and operate the team. "They work in the morning and they practice in the afternoon. These companies provide a basic salary and job security, so it is rare for these amateur players to change teams. "Professional players in Japan are the same as any other country. They may receive higher pay but their future is unstable and not secure." Having previously played alongside solely professional players in England, Haskell says this company rugby concept was hard to comprehend. "Typically in Japan you have a squad of 60 players, of which 12 are full-time and the rest go to work every day," he explains. "So guys in our side at Ricoh would, say, work at the marketing department there and then come to training after a full day's work. "It's a strange concept to us but the Japanese employment laws are such that generally people have a job for life and people don't want to give up that contract. So you could get an odd mix of senior management playing alongside junior workers." Confidence is growing in Japan, where Top League players have been able to learn from the likes of World Cup winners Sonny Bill Williams, of New Zealand, and Australian Stephen Larkham. Indeed, Japanese players have even been selected for Super Rugby franchises, if only in bit-part roles. This year Harumichi Tatekawa became the third from his country to do so when he was signed by Australia's ACT Brumbies. Ahead of hosting the 2019 World Cup, Japan is hoping to build on its first win over a major rugby nation -- last June's 23-8 victory over a Wales team bereft of 15 players away on British and Irish Lions duty. Jones says he is hoping to use the sevens format to develop players for the 15-a-side stage, and there will be two players from the top squad in the team taking part in Tokyo this weekend. "We're trying to use the sevens now to put young players into the game to improve international experience, their skills and their speed," he says. "We're trying to create a team where they learn the skills they need to play 15s. Because we play quite a unique style of rugby, we need to keep the ball and pass the ball, and run with the ball, so the skills that we need are ideally suited to sevens." 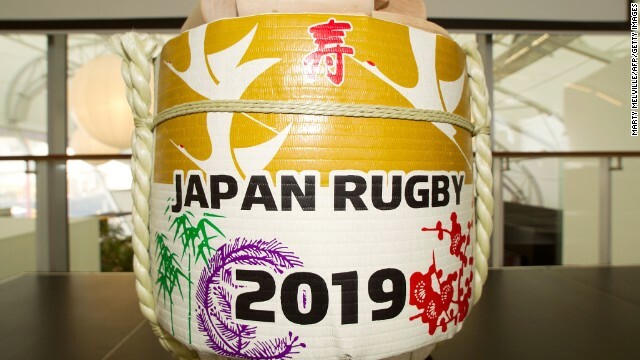 An International Rugby Board delegation visit to Japan last month found a country renowned for its efficiency already with the necessary infrastructure and good transport links in place required to stage an event as big as the World Cup. The growth of rugby could be helped by reports suggesting a Japanese team might be included if the Super Rugby competition -- which features sides from New Zealand, Australia and South Africa -- is expanded in 2016. And the sport was given an imperial seal of approval when Japan's Emperor Akihito attended a club match last month at Tokyo's Prince Chichibu Stadium, home of the national side and named after his late uncle. "I don't think he goes to many sporting events, so to have him attend the game was quite significant," says Jones. But there are still obstacles. A notorious lack of green space, particularly in a city like Tokyo, means that pitches are in short supply. The existing ones are overused from dawn to dusk each day for a multitude of different teams. Also, at the elite level, television coverage remains an issue in a country where football very much reigns supreme, especially since the introduction of the J-League in 1992. 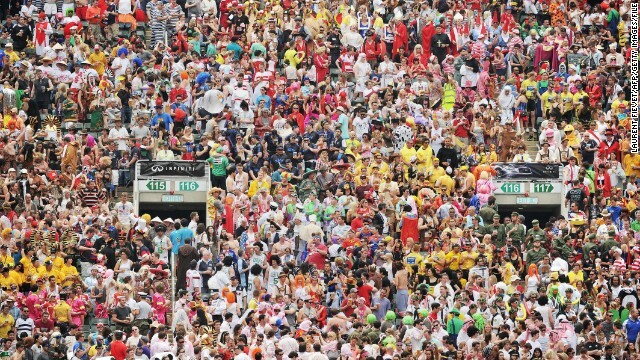 Fujino explains: "Even after the decision of Japan to host the World Cup, fans attending the games for the 2013-14 season saw an increase of only 1% (to an average 4,300). "During the '80s and '90s, college rugby saw its peak in popularity but, after the establishment of the professional football league, rugby's popularity went downhill." While spectator numbers are only just edging up, it is playing figures that the International Rugby Board is looking to, and that area has experienced growth. There is also a sense of national pride, so the 2019 World Cup looks set to bridge those potential issues -- even with the prospect of the even bigger Tokyo Olympics a year later. But as Mori said at the time of Japan winning the bid: "The god of rugby smiled on us today. I am filled with emotion to be part of this historic day for Japan and for rugby around the world. Japan has much to offer rugby." The World Cup should help to push the Japan Rugby Football Union, the Top League teams and elite players in the right direction together. In the past, players have been prevented from playing for the national side by employers fearful of the risk of injury at a time when there is increasing pressure to win company games. 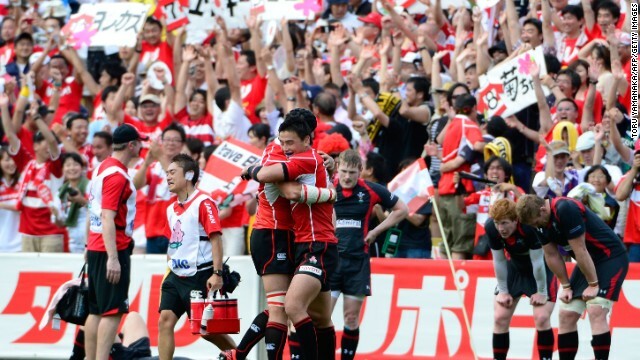 Whether rugby will ever be truly big in Japan remains to be seen. Samisoni Viriviri is the first Fijian to be crowned Player of the Year by the International Ruby Board. CNN's Andrew Stewart report. England captain Tom Mitchell goes head to head with his Scottish counterpart Colin Gregor. CNN's Christina Macfarlane looks at how the 2014 Commonwealth Games could help generate more interest in the sport. Long-time rugby fans don't need graphs or charts to see that players are getting bigger -- but see how they compare to other athletes. New Zealand may have retained the Sevens World Series in fine style, but a Fijian claimed the honor of being named top player. As a young child in Fiji, rugby star Waisale Serevi strained to hear tales of his heroes through the crackles of an old transistor radio. Two years ago, Kayla McAlister was playing netball. Now she's the world's best rugby sevens player, emulating her All Black sibling Luke. By day, he dons a white lab coat and seeks to rid the world of disease. At weekends, he terrorizes opposition teams in his bright red outfit. Not only is she getting hitched this month, but Winter Olympics star Elana Meyers is hoping to wed her bobsleigh skills to an entirely different ball game. Welcome to Hong Kong, where the battle to create the greatest costume is almost as fierce as the action on the pitch in the HSBC Sevens World Series. 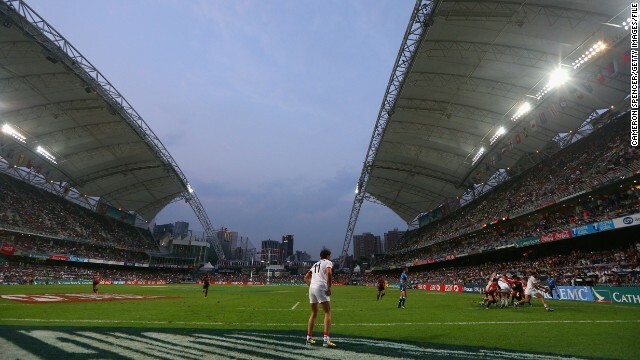 The annual sporting jamboree is the highlight of the social calendar for rugby fans who flock to the Hong Kong Stadium in their thousands. His name means "bright light" in Japanese and he's already shining on the global stage. Meet the young New Zealander being hailed as the next Jonah Lomu. Spawned by university professors and dominated by big corporations, rugby in Japan is certainly different -- but it is also on the rise. 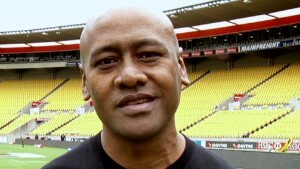 Many have matched his size, some his speed, but no-one ever combined the two to such devastating effect on a rugby field as Jonah Lomu.